When I think of us I think of long winded conversations, endless laughter, kisses on foreheads and the way in which he calls me sweetheart after he says he loves me - the softness that resides in his words as they fall from his mouth makes me swoon each time. 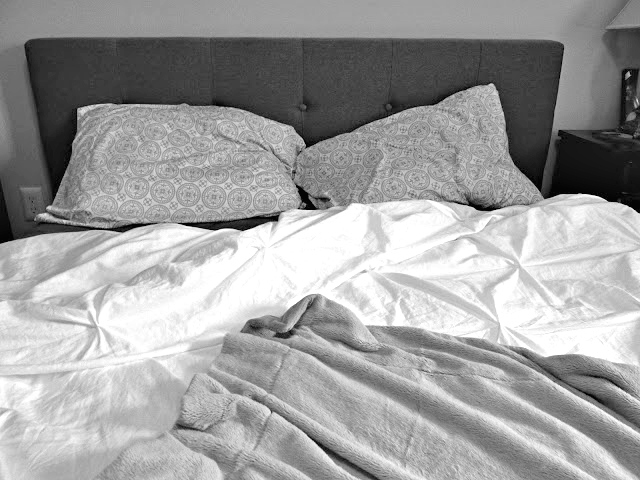 It's us sprawled across our bed, limbs tangled with one another and our white sheets. It's us drinking coffee too late at night and binge watching shows that we end up pausing in order to talk. We are past, present and future; teenage sweethearts that somehow, with magic and luck on their side, managed to find one another in adulthood - at a time when we both needed each other more than ever. Alex, the love I have for you is deep, deeper than any ocean and every time I look at you I know that I have loved you all along. And when you're big, brown eyes stare into mine, early in the morning when we are first waking up - sun pouring through the window, it leaves my heart so full that I swear it could simply burst at any given moment.